Nicolaos, Classical Athens's favorite sleuth, and his partner in investigation, the clever priestess Diotima, have taken time off to come home and get married. But hoping to get hitched without a hitch proves overly optimistic: A skull discovered in a cave near the Sanctuary of Artemis, the ancient world's most famous school for girls, is revealed to be the remains of the Hippias, the reviled last tyrant to rule Athens. The Athenians fought the Battle of Marathon to keep this man out of power; he was supposed to have died thirty years ago, in faraway Persia. What are his remains doing outside the city walls? Nico's boss, the great Athenian statesman Pericles, wants answers, and he orders Nico to find them. Worst of all, one of the two Sanctuary students who discovered the skull has been killed, and the other is missing. Can the sleuths solve the interlocked crimes before their wedding? is the author of four other Athenian mysteries: "The Pericles Commission," "The Ionia Sanction," "Sacred Games," and "Death Ex Machina." He lives in Sydney, Australia, with his wife and two daughters. He blogs at A Dead Man Fell from the Sky, on all things ancient, Athenian, and mysterious. "Corby serves up a bubbly cocktail of clear history, contemporary wit, and heart-stopping action." "Outstanding . . . Everything works in this installment—the detective business, the action sequences, the plot twists, and the further development of the series lead." 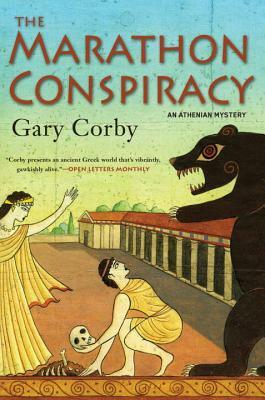 "Corby has not only made Greek history accessible—he's made it first-rate entertainment." "Those who like their historicals with a touch of humor will welcome Australian author Corby's promising debut ... Corby displays a real gift for pacing and plotting." "Mix one part ancient history, one part clever and contemporary banter, and one part action, and you have a top-notch crime caper ... Highly recommended for those looking for humor with their crime detecting."